Call on the turtle in the heart chakra for those times you need support opening your heart and emerging from your shell. If you connect to bear and the heart chakra, it may mean you need to climb into a warm and cozy den for a period of healing and rejuvenation. Work with the butterfly in the crown chakra when journeying into higher realms of consciousness and reconnecting with the beauty you find there. 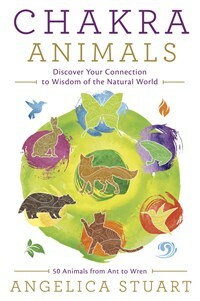 In this book, you will discover chakra interpretations for each of the seven chakras for all fifty animals—350 bite-sized bits of chakra wisdom in all! These insights will help you focus on specific goals that are important to you and they will help you remove inner blocks that may be holding you back. You will also discover tips and techniques for integrating the chakra wisdom into your life and stories of personal transformation to help you process the profound guidance the animals share with you. Angelica Stuart has been a spiritual practitioner for nearly 40 years. In the late 1970s early '80s, she was initiated into a Welsh tradition, but for the last 25+ years her journey has been more eclectic, incorporating many different paths, including shamanic studies, working with the Archangels, being an observer of people, and of course, working with the chakras as a way to connect with her first love—the natural world.